[By Nick, discontinued before 2013 season] I will never understand why cheesecake has such a following. I mean come on, it’s an okay dessert but definitely not something that deserves a restaurant devoted to it. I guess I just don’t appreciate cheese in my desserts. I’ve never liked cannolis, which being Italian is practically considered sacrilegious, and tiramisu has never done it for me either. 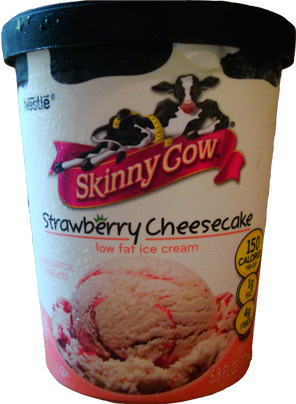 Putting my bias aside, I saw this little single serve container of Skinny Cow Strawberry Cheesecake and thought “what the heck?” and decided to give it a shot. I’ve only tried one kind of cheesecake ice cream in the past. Walgreens makes a store brand strawberry cheesecake and I’ll admit that I found it to be pretty good. Hopefully Skinny Cow will continue my positive run into the cheesy ice cream world. This cup is definitely a winner and a failure. It wins in the strawberry department. 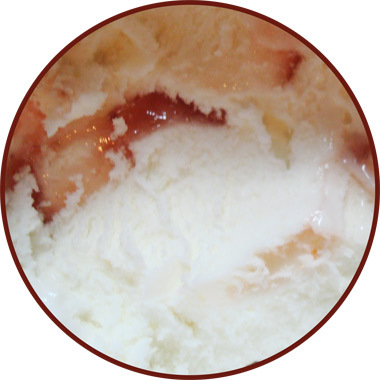 The swirls are nice and have the consistency of jam. There’s nothing artificial about the flavor and they even manage to incorporate little bits of strawberry seeds in the swirl as well. Now if this was marketed as Strawberry Swirl Ice Cream this would be a big success, however it does have cheesecake in its name and that’s where it fails. Sampling the base alone, there is little to no cheesecake flavor at all. The best way I could describe the flavor is that it is milky. It’s what I’d imagine ice cream would taste like without any added flavor. I literally think I only tasted a cheesecake flavor when I was really trying to concentrate on finding the flavor. So for all I know my mind might’ve been playing tricks on me. I’m not saying the base is bad by any means but cheesecake it is not. 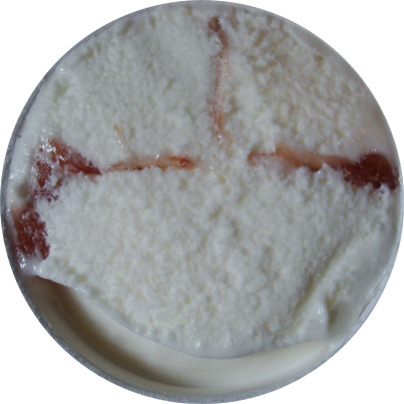 The texture is your standard low fat ice cream with a little bit of chew but nothing offensive. I’ve actually experimented a bit and found if you let it sit out a little the consistency improves immensely. I dig the chew of some ice creams though so I guess I’m a little biased as well. The nutritional info isn’t too shabby either. There’s only 150 calories and 1 gram of fat per cup which is a steal if you ask me. I could definitely see this taking up some of my freezer space more often. Verdict? Lacking cheesecake flavor but the strawberry swirls more than make up for it.